I would like to start this blog post with an apology – I had wanted to document each step of my nkoda journey here but I simply have not had the time to do so. To say the last 6 months of my residency here in London have been frenetic would be an understatement. But I do want to share some of the experience of this exciting project now that the iOS version has been released. To create an effective streaming platform, the range and depth of the content is critical for success. Content is the focus of my role here at nkoda, and I am involved with the publishers in every aspect of their involvement on the platform, as well as providing knowledge and technical support to aid them in their transformation from print to digital. The faith shown in nkoda by our initial partners was immense, especially as we had to start working on the platform content and the infrastructure that surrounds it many months before we had an app to see the results. I would like to take a little side-step and praise the work of the amazing nkoda CTO Sundar Venkitachalam. The complexity of architecture required to deliver the millions of pages of nkoda content as efficiently and securely as we do is nothing short of miraculous. The content we provide is sourced from single page PDFs of guitar tabs to massive full scores of operas that are hundreds of pages long. Every PDF (with our current record being a 2Gb full score of a french opera) must be converted, encrypted, stored, indexed and deployed seamlessly, something the nkoda framework has done from the very beginning. It is perhaps one of the great ironies of technology that you only really become aware of it when it does not work, and so many great achievements like this go largely unrecognised. Bravo Sundar! Even with the close co-operation of our publisher partners, nkoda faced a real challenge to ensure our platform had sufficient content at launch to make the subscription model viable. We really only need 2 things to publish on nkoda – a PDF that is in reading order, and some metadata to describe its content. Although publishers had terabytes of PDFs waiting to be used for digital, the vast majority of these had issues of one kind or another due largely to the fact that this was a digital archive for printers, not for screens. Typically we would have to deal with printers’marks and the majority of content we processed had to be reorganised in some way (split apart, joined together, rotated and reassembled) so that the pages were in reading order. We then had to marry up these files with the various sources of metadata. While we can automate some of these tasks, all of these actions require some level of human input. To do this at the scale and speed necessary to meet our goals required more resources than any publisher could deploy. So, early this year. nkoda embarked on a recruiting drive for musicologists and music graduates to help us help the publishers transform their digital archives into a publishable form. Today our team of music specialists are around 30 women and men from all over the world, and they have created something quite remarkable. By my own estimation, they have examined more than 7 million PDF pages to check for errors, omissions and discrepancies (and there have been many). 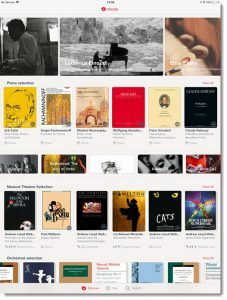 They have also fixed metadata, created covers, and assigned UICs for almost all of this amazing repository of music, much of which has never been available in a digital format before. We are very proud of the content you will see in nkoda – it has been an incredible achievement by everyone involved. If you are a publisher that would like to access this resource to help get your content available in nkoda quickly, do not delay as it is only possible to maintain this level of activity and expertise while there is a large amount of content to ingest. I would also like to take another side step and talk about the UIC. If you look back in this blog you will see that this system was created with a digital delivery system in mind, and nkoda is the first to be built completely around UIC architecture. We are curating a valuable resource 0f UIC best practice, which I would encourage all HLMSW users to read here: nkoda UIC and Instrumentation Guidelines The UIC is also now in 11 languages (English, Simplified Chinese, German, French, Italian, Japanese, Korean, Portuguese, Polish, Russian and Spanish) to match the launch languages of nkoda. The final chapter of this story is that we will soon be providing advanced search tools which will allow you to search the nkoda catalogue for instrumental combinations to a level that has never before been possible. I think the one aspect of this whole experience that makes me so excited is that while we are generating new income streams and protecting the intellectual property of our publisher partners and their authors, the nkoda platform gives unfettered access to the best music and editions for musicians and scholars like never before. If you miss the experience of browsing shelf after shelf of sheet music at your local music store, I recommend you check out nkoda and relive that feeling of discovery which is being enjoyed by our customers all over the world.